Cheryl White, the first black female jockey in the U.S., was a true horse racing pioneer, and one could only imagine the hurdles she overcame to pursue her career. On June 15, 1971, Cheryl White found herself in the starting gate at Thistledown Racetrack aboard a horse named Ace Reward. It was her first official race, and she was extremely focused. "I just wanted those gates to open," she told me recently. “I wasn't nervous and knew I'd be first out and get the lead." Cheryl was right. She took command in the $2,600, six-furlong event, and for almost half the race, she looked like a winner. But Ace Reward and White would finish dead last of 11 horses. Nonetheless, Cheryl White had made history with her ride, becoming the first African-American female jockey of our time. Cheryl grew up around horses and countless other critters. "We moved to the country when I was very young, so I always remember being around horses and being very comfortable around them. And we had all kinds other animals," she said. White came from good racing stock. Her father, Raymond, started his career as a jockey in Omaha, Nebraska, in 1924 and rode in Chicago, Cleveland and Cincinnati, among other places. Raymond started training horses toward the end of his riding career and even conditioned two horses that ran in the Kentucky Derby. Cheryl's mother, Doris, was an owner whose horse's often ran at Thistledown. Cheryl was interested in becoming a jockey, and her parents were mostly supportive. "They encouraged me, but with my father being in the horse business, he wasn't exactly in favor of female riders," she said. "My Dad was just old school and didn't believe, like many old timers, that women belonged around the racetrack. There was a time when women weren't even allowed on the backstretch after five o'clock. But my parents didn't try to talk me out of it, either." White didn't do any better in her second outing and ran dead last again, but it didn't faze her. She was granted an apprentice license on June 26, 1971, and two months later, it happened. 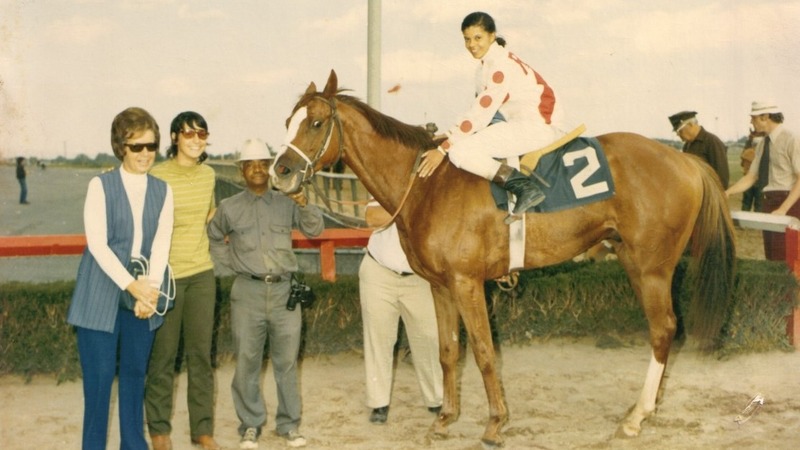 White rode her first winner on September 2, 1971 at Waterford Park on a horse named Jetolara, becoming the first black woman to win a thoroughbred horse race in the United States. White received enough attention to be invited to the "Boots and Bows Handicap," an all-female riders race in Atlantic City in 1972. She won on the longest shot on the board in a field of 14. But the race wasn't without controversy, as fellow rider Mary Bacon was angry at White after the race and accused her of coming over on her horse. But the two women were friends and eventually put the issue behind them. White continued riding in her familiar circuit and held her own, but she needed more. While visiting friends in California in 1974, she decided to ply her trade at the warm and sunny Southern California tracks. But Santa Anita, Hollywood and Del Mar were just plain tough venues to compete at, and few female riders found major success on the California circuit. "I probably should've stayed in the east instead of heading west," she told me. "I think the tracks on the East Coast and Midwest were much more accepting of women riders, at least thoroughbred-wise. There were always five or six at any track I was at. Successful female jockeys on the East Coast, well, I don't think they would've done as well at the western tracks. They just wouldn't have gotten the (good) mounts and the opportunities that female jockeys had back east and in the Midwest." White shifted her attention to riding Quarter Horses, Paints and Appaloosas at the California County Fairs. She had a reputation for being fast out of the gate and was in high demand on the California Fair circuit. She topped the rider standings and earned the Appaloosa Horse Club's Jockey of the Year in 1977, 1983, 1984 and 1985 and was inducted into the Appaloosa Hall of Fame in 2011. Cheryl White also became the first female jockey to win two races in two different states on the same day when she rode a winner at Thistledown in Ohio in the afternoon and scored again in the evening at Waterford Park in West Virginia. She was also the first female jockey to win five races in one day, accomplishing that feat at Fresno Fair. In 1989, White dislocated her hip and started making plans to find an easier way to make a living. In 1991, she passed the California Horse Racing Board's Steward Examination and rode her last race on July 25, 1992 at Los Alamitos and just happened to go out a winner. She's since served as a racing official in various roles at several different racetracks. Since her retirement, White has ridden several times in charity events, competing with fellow retired female riders. Today, White works happily as a placing judge at Mahoning Valley Race Course in Ohio. She has a brother and nephew who have an advertising business, [Kabango Media](http://kabangomedia.com/). It gives the family pleasure to see the name of the company, as it was named after one of Cheryl's father's favorite horses, Kabango. Although it seems White was severely underrated, she did get some coverage and awards. In 1994, she was honored as one of the "Successful African Americans in the Thoroughbred Racing Industry" by the Bluegrass Black Business Association in Lexington, Kentucky. She was also honored by the National Girls and Women in Sports Day, presented by the Amateur Athletic Foundation of Los Angeles, California in 2006. I asked Cheryl if she could sum up her career in a few sentences. "I had a long and relatively successful career winning 750 races. I got to retire on my own terms and of my own choice and basically in one piece. I was very lucky to have had a job that I loved and had a passion for. Many people just aren't that lucky. It's been a long road, but it's also been an interesting and very lucrative and fun road," she said. "I wouldn't trade it for anything." When I asked about any possible plans of retirement, Cheryl said, "Retire? Retire from this? I was a race track brat as a kid, and I'm probably going to die on the track!" Cheryl White was a true pioneer in our sport, and one could only imagine the hurdles she overcame to pursue her career. She was young and determined, ignored the drama and the bigots, and just put her head down and rode. She paved the way for countless people to pursue their own dreams, both on and off the racetrack. It's truly fitting that Cheryl White went out a winner in her last race, as she's surely a winner in my book.